Dymatize Elite Mass is the ultimate gainer formula designed to help you pack on maximum lean mass and recover from your intense workouts. This cutting edge formula delivers a massive 600 calories, complete with 55 grams of premium quality protein, complex carbohydrates, lean lipids, glutamine, creatine, branch chain amino acids and a comprehensive vitamin and mineral blend! Everything you need to gain muscle and body size and recover faster from strenuous workouts. 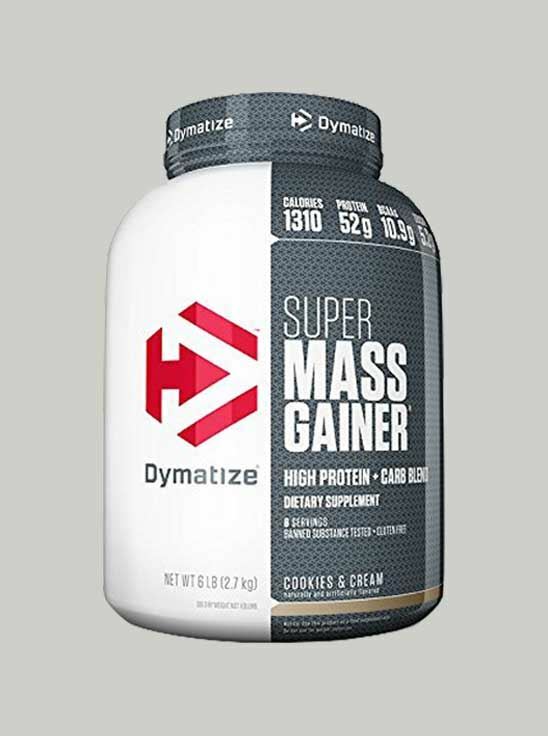 Premium Sustained-Release Protein Blend: Dymatize Elite Mass contains a special premium protein blend of cross-flow, microfiltered, cold-processed, ion-exchanged whey isolate and concentrate, calcium caseinate and egg proteins. This protein blend, which is very low in lactose and has a superior amino acid profile, has been instantized for easy mixing without a blender yielding unbeatable bioavailability and digestibility. Complex Carbohydrate Matrix Dymatize Elite Mass also contains a sustained complex carbohydrate matrix with waxy maize starch, to help fuel and drive amino acids into your muscle fueling growth and recovery. Advanced Lipid CompleD:\Neucom2\neucom\Neucom2images Lipids are a highly concentrated energy source - more than double that of protein or carbohydrates and are a necessary component in cellular growth. This scientific lipid blend, including medium chain triglycerides (MCTs), is readily available muscle fuel only seen in Dymatize Elite Mass. Strength and Recovery Blend: To round out this high-performance gainer creatine, glutamine and the BCAAs (L-Leucine, L-Isoleucine, and L-Valine) are added to optimize the results of each strength-training workout while a complete vitamin and mineral profile helps to ensure your body gets the balanced nutrition it needs to get bigger and stronger. Dymatize Elite Mass will help you pack on the lean mass and develop the physique you've always wanted. For optimal results, combine with a sensible diet and an intense training program.